It all began in the fall of 2009. A discussion by a group of students, led by three women’s passion for increasing awareness about the Holocaust, sparked an idea that went on to become the Unknown Child Holocaust Pennies Project. It was a simple concept: collect one and a half million pennies in memory of the 1.5 million Jewish children (out of 1.6 million who lived in German-controlled territories) who perished during the Holocaust. The students went to work, writing letters to actors, athletes and politicians and asking everyone they could think of for donations. The following year, a local home school group who were already raising funds for a similar cause joined them. The owner of the Peabody Place Mall even gave the students permission to scoop up all the coins in the fountain. There was a contagious excitement as the number of pennies grew and grew and grew. For three years they kept collecting coins, and begin developing relationships with the local Jewish community. 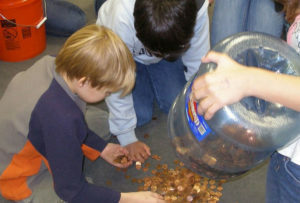 Soon after, the students were finally able to achieve their goal: they collected 1.5 million pennies in remembrance of the unknown children of the Holocaust. The completion of this special project directly led to the formation of the Unknown Child Foundation, organized for the express purpose of creating a children’s Holocaust remembrance park (one of very few in the world) in Desoto County. The Unknown Child Foundation has commissioned celebrated artist Rick Wienecke from Israel to create the sculpture of the Unknown Child and look forward to building a world-class destination that will keep alive the memory of the unknown children of the Holocaust.